4th February was Russell Hoban Day, which is an annual event to celebrate Russell Hoban and his work. It would have been his 90th birthday. On Russell Hoban Day, fans write quotes on yellow pieces of paper and leave them in public places for people to find. 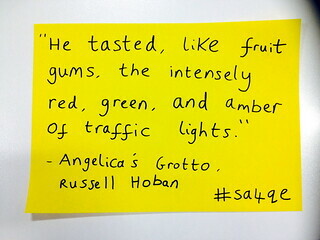 "He tasted, like fruit gums, the intensely red, green, and amber of traffic lights." 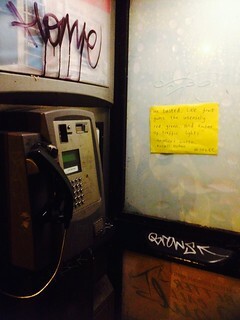 I wrote my quote on a sheet of yellow A4 paper, and then looked for somewhere in London to leave it. It was a cold night, and the moon was bright, and I spent time looking at traffic lights to see if I could blu-tac the quote there, but the streets were busy, so I decided against it. In the end, I stuck the quote up in a phone box that was missing a door. The phone was in a poor condition with wires hanging out of it. There were cobwebs in the top corner of the phone box and on the outside was a poster advertising a circus.